Julian Pauncefote, 1st Baron Pauncefote, GCB, GCMG, PC, 1828-1902. British diplomat. Dated signature and title, on blind-embossed engraved stationery of the British Embassy, Washington, [D.C.], one page, 4¾" x 7¼", with integral leaf attached. Pauncefote has boldly penned his signature and title, “His Excellency The Right Honorable Sir Julian Pauncefote G.C.B. G.C.M.G. H.B.M. 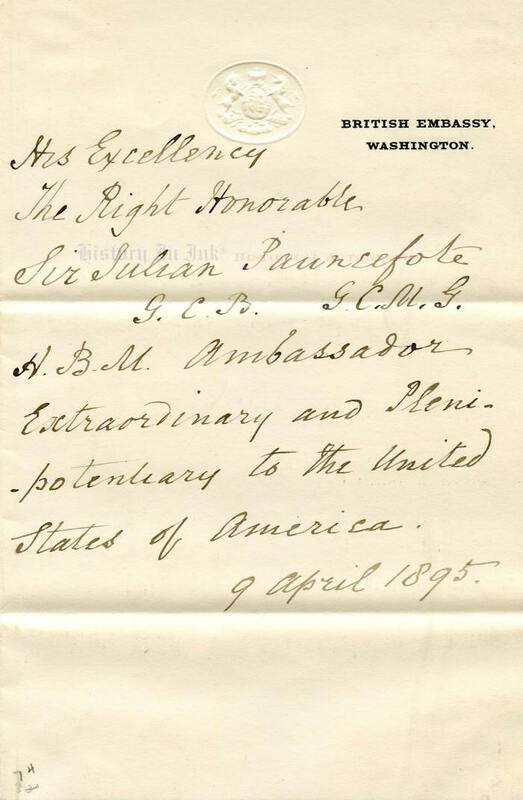 Ambassador Extraordinary and Plenipotentiary to the United States of America" and has dated the piece in his hand, "9 April 1895." A barrister and judge, Pauncefote is perhaps best known for negotiating the 1901 Hay-Pauncefote Treaty with American Secretary of State John Hay, clearing the way for American construction of the Panama Canal. The treaty nullified the 1850 Clayton-Bulwer Treaty, under which both nations renounced the right to build a canal across the Central American isthmus under the control of one nation. The Hay-auoncefote Treaty gave the United States the right to build and control a canal across the isthmus from the Atlantic Ocean to the Pacific Ocean. Pauncefote was Britain's Permanent Under-Secretary of State for Foreign Affairs from 1882-1889, when he was appointed Envoy Extraordinary and Minister Plenipotentiary to the United States. The office was upgraded to that of Ambassador in 1893, and thus Pauncefote became the first British ambassador to the United States. He was named a member of Queen Victoria's Privy Council in 1894 and was elevated to the peerage as Baron Pauncefote in 1899. He died at the British embassy in Washington, D.C., in 1902. This is a nice example of Pauncefote's holograph. His black fountain pen writing is crisp and beautiful. The piece has two normal mailing folds and a small collector's pencil notation at the lower left, and there are mounting traces on the back of the integral leaf. Overall the piece is in fine condition. Unframed. Click here for information about custom framing this piece. Click here to see more World History items. The watermark does not appear on the actual item.